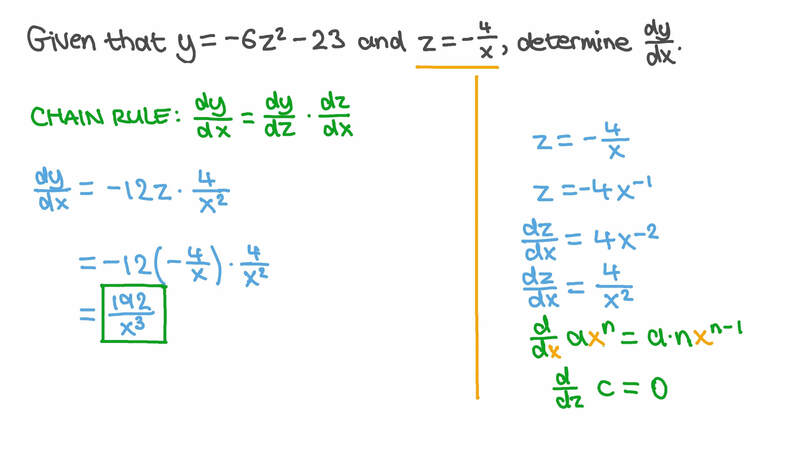 In this lesson, we will learn how to find the first-order derivative using the chain rule. If 𝑦 = ( 𝑧 + 1 1 ) 7 and 𝑧 = 5 𝑥 + 8 2 , find d d 𝑦 𝑥 . Given that 𝑦 = − 6 𝑧 − 2 3 2 and 𝑧 = − 4 𝑥 , determine d d 𝑦 𝑥 . Evaluate d d 𝑦 𝑥 at 𝑥 = 2 if 𝑦 = − 𝑧 3 and 𝑧 = 6 𝑥 − 8 . Find d d 𝑦 𝑥 , given that 𝑦 = 𝑧 2 and 𝑧 = 9 𝑥 + 2 2 . Determine d d 𝑧 𝑥 when 𝑥 = 1 2 if 𝑧 = 𝑦 3 + 2 𝑦 + 1 3 and 𝑦 = − 2 𝑥 + 𝑥 − 3 2 . Evaluate d d 𝑦 𝑥 at 𝑥 = √ 3 if 𝑦 = ( − 2 + 𝑥 ) ( − 2 − 𝑥 ) 4 4 . Evaluate d d 𝑦 𝑥 at 𝑥 = 4 if 𝑦 = 𝑧 − 5 𝑧 + 1 2 and 𝑧 =  ( 𝑥 − 3 ) 3 2 . Find d d 𝑦 𝑥 , given that 𝑦 = ( 𝑧 + 9 ) 3 and 𝑧 = 𝑥 − 9 4 . Evaluate d d 𝑦 𝑥 at 𝑥 = 0 if 𝑦 = 5 √ 𝑧 and 𝑧 = 𝑥 + 1 6 𝑥 + 1 . Evaluate d d 𝑦 𝑧 at 𝑧 = 3 if 𝑦 = 𝑥 − 3 𝑥 + 3 and 𝑥 = 3 𝑧 + 4 . Evaluate d d 𝑦 𝑥 at 𝑥 = − 2 if 𝑦 = 𝑧 + 1 𝑧 − 1 and 𝑧 = 𝑥 − 1 𝑥 + 1 . Evaluate d d 𝑦 𝑥 at 𝑥 = 4 if 𝑦 = 𝑧 + 3 𝑧 + 1 3 and 𝑧 = 𝑥 − 1 0 𝑥 − 3 . Given that 𝑦 = 𝑧 − 8 𝑧 + 1 6 4 2 and 𝑧 = 2 5 𝑥 s i n , determine d d 𝑦 𝑥 . Given that 𝑦 = − 4 𝑧 + 3 2 𝑧 s i n and 𝑧 = − 2 𝑥 + 𝜋 , find d d 𝑦 𝑥 at 𝑥 = 0 . If 𝑦 = ( − 8 𝑧 + 1 ) 3 and 𝑧 = 1 6 2 𝑥 c o s , find d d 𝑦 𝑥 when 𝑥 = 𝜋 4 . If 𝑦 = ( 7 𝑧 + 3 ) 4 and 𝑧 = 1 7 2 𝑥 c o t , find d d 𝑦 𝑥 at 𝑥 = 3 𝜋 8 . Given that 𝑦 = 𝜋 𝑧 3 6 c o t and 𝑧 = 6 √ 𝑥 , determine d d 𝑦 𝑥 at 𝑥 = 4 . Find d d 𝑦 𝑥 at 𝜃 = 𝜋 6 , given 𝑥 = 7 5 𝜃 + 3 3 𝜃 c o s c o s 6 and 𝑦 = 3 2 𝜃 + 7 3 𝜃 s i n s i n 6 . Find d d 𝑦 𝑥 , given that 𝑦 = 8 𝑧 + 1 𝑧 and 𝑥 𝑧 = 9 . Given that 𝑦 = 2 𝑥 − 2 2 and 𝑥 = 𝑧 − 1 3 , determine d d d d 𝑦 𝑧 + 4 𝑥 𝑧 . Given that 𝑦 = √ 7 − 4 𝑧 and 𝑧 = 2 𝑥 t a n , determine d d 𝑦 𝑥 at 𝑥 = 𝜋 8 . Evaluate d d 𝑦 𝑥 at 𝑥 = 2 if 𝑦 = 2 √ 𝑧 + 9 √ 𝑧 and 𝑧 = 2 𝑥 + 1 2 . Given that 𝑦 = 8 𝑧 − 6 𝑧 − 9 3 and 𝑧 = 3 𝑥 − 2 7 𝑥 , determine d d 𝑦 𝑥 when 𝑥 = − 3 . Given that 𝑥 = 𝑡 + 1 2 and 𝑦 = 𝑒 − 1 𝑡 , find d d 𝑦 𝑥 . Determine d d 𝑦 𝑥 at 𝑡 = 0 , given that 𝑥 = ( 𝑡 − 2 ) ( 4 𝑡 + 3 ) , and 𝑦 =  3 𝑡 − 4  ( 𝑡 − 3 ) 2 .